Description: The crew put on a great show as they passed by around 50 mph. Description: The train climbs the hill in down town Cuba. Description: The Amtrak Unit brings up the rear carrying the markers. At least they didn't put it at the front of the train. Description: The engine and crew put on a great show with plenty of smoke! Description: Since the train was operated under Amtrak Auspices, they had 205 on the rear as protection power. Description: Rounding the curve at Amstedam. Description: AMTK 205 helping out on one of 1522's last runs. Description: #448 idles at Springfield. Description: #448 idles at Springfield station. Description: Seen from the westbound California Zephyr. Description: I lik these things but they're no F40. 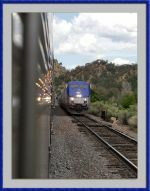 Description: Amtrak P42 205 highballs through Westmont with the westbound California Zephyr. Description: This guy showed up with a single express car headed southbound at about 30mph. Description: 205 pulls out of Rocky Mount, NC with the Silver Star #92 northbound to New York.